Glam up a pumpkin with silver sequins, rhinestones, and a metallic silver spider for a fancy glitter pumpkin that is all-too chic. 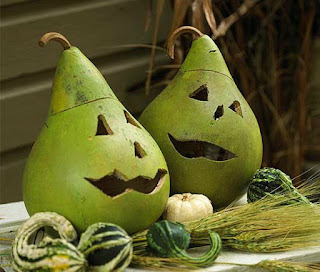 Search farmer's markets for unique varieties of pumpkins and gourds as alternatives to classic orange pumpkins. 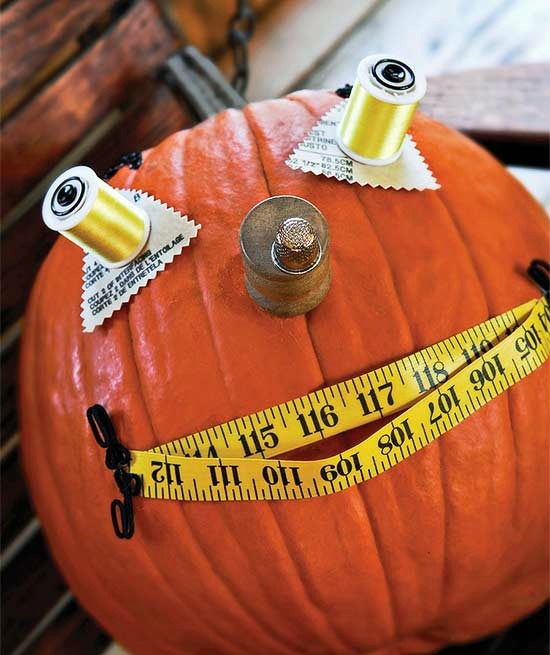 Then carve out cute pumpkin faces for an irresistably adorable new look. 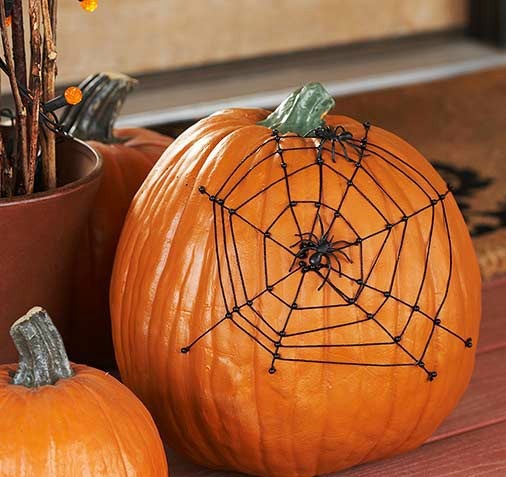 For those who don't shriek at the sight of spiders, download and print our free pattern, enlarge to a size to fit your pumpkin, and cut out the pattern pieces. Trace the pieces onto construction paper, using the photo as a color guide. Layer the eye pieces and secure with crafts glue. 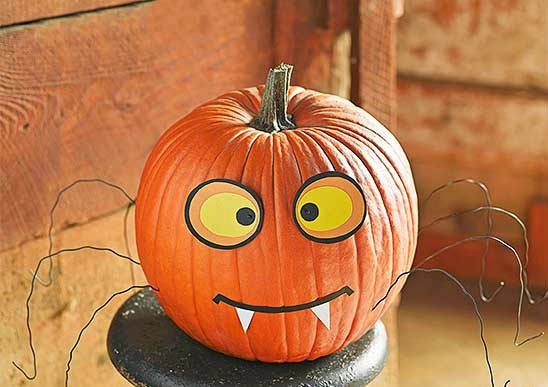 Glue the eyes, mouth, and fangs to the pumpkin. Poke four wires into the pumpkin on each side of the face and bend to form eight scurrying legs. For a fun take on decorating pumpkins, grab odds and ends -- door hinges, upholstery tacks, old keys -- from the junk drawer and add embellishments. 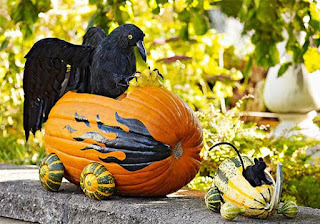 For a new pumpkin decorating idea, stage a Halloween car chase with automobiles crafted from pumpkins and gourds. Then choose your drivers. We opted for a raven and a mouse as our racing creatures. 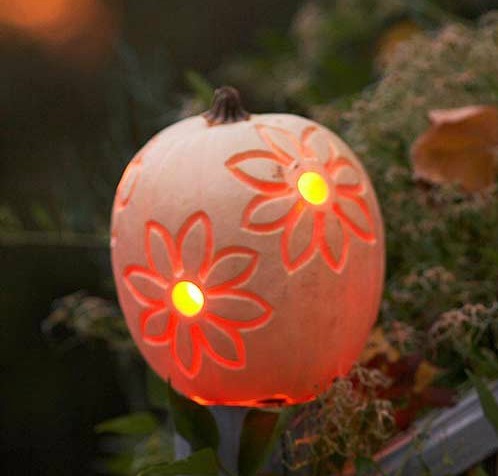 Illuminate flowers instead of jack-o'-lantern faces with light up pumpkins. For this blooming pumpkin, use an apple corer to carve out the flower centers. Then use a triangle clay loop tool (available at art stores or dickblick.com) to etch petal designs around the holes -- scraping away only the pumpkin surface. Decorate a pumpkin with a knotted spiderweb. Using heavy, metallic black stitching braid, cut web "spokes" to the desired lengths and knot each end. 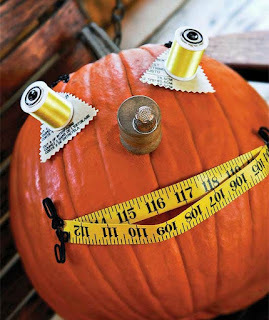 Tack the ends in place on the pumpkin using short black map pins. Circle the intersecting web pieces in the same manner, knotting the ends and using pins to hold the braid in place. 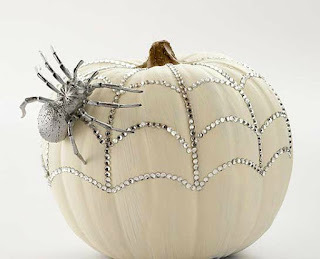 Complete the look by hot-gluing a spider or two onto the web. 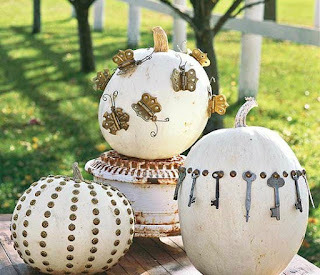 Instead of carving, use found objects when decorating pumpkins. We raided the sewing basket to design this clever personality: spools of thread for the eyes; a spool of thread and bobbin for the nose; and a tape measure for the mouth. Watch out -- this menacing jack-o'-lantern dude may be looking for you. 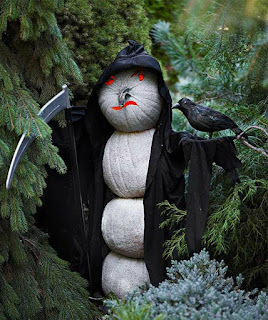 With a tall stature and snarling face, he is the keeper of Halloween fright.